A Londoner has won an apology from the Met after wrongly being prevented from taking pictures of two police vehicles that had crashed into each other. 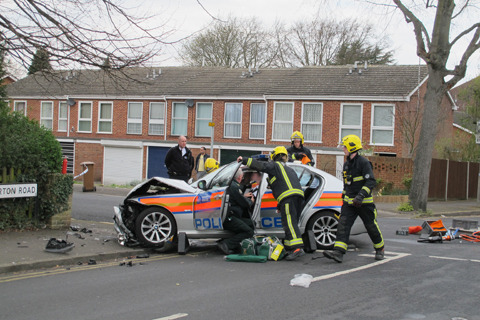 The photographer had been taking pictures using a Canon PowerShot G12 digital compact after a collision between a police car and a police van in Sutton on 3 April. Officers in the vehicles had been responding to a local burglary and were not badly hurt. The man, a retired geologist, was standing in a public road when an officer told him to stop taking pictures and leave the scene. 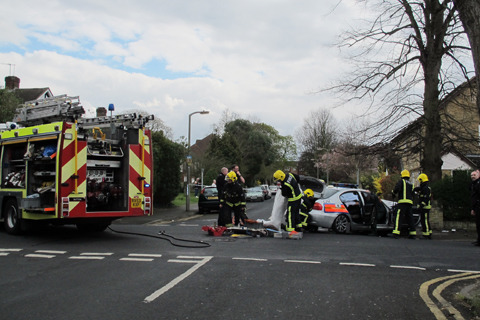 At the time, the road had been cordoned off to vehicles but police tape did not extend to adjacent pavements, allowing the public legitimate access. ?It was quite clear they didn?t want publicity for what was basically a police error,? claimed the man who preferred that his name not be published. ?I didn?t interfere in any way with their operations. They shouldn?t have stopped me taking pictures,? he said in an interview with Amateur Photographer (AP). The photographer said that two other officers had not prevented him taking photos. And he had already seen someone capture pictures of the scene using a mobile phone. ?I am always courteous and I stood well back,? said the photographer, accusing one officer of adopting an ?aggressive? manner. When he returned with a Nikon D5000, a DSLR, the same officer repeated the objections and was joined by another who said: ?I could seize your camera as part of evidence to be used in the crash investigation.? Police did not ask the photographer to supply his details and no further action was taken. Neither did the officers ask to see any digital images taken. 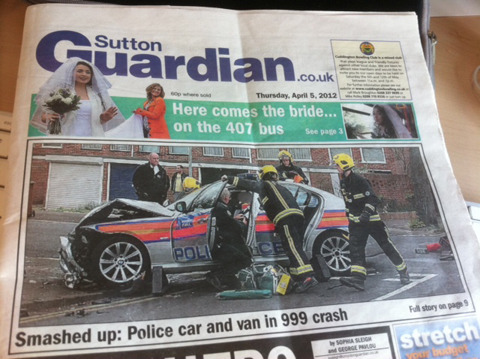 Realising the potential news value of his pictures, the photographer contacted local newspaper the Sutton Guardian, which ran one of his shots on the front page of the paper?s 5 April edition. A spokesman for the Metropolitan Police?s Safer Sutton Partnership Service today said the matter has been raised at ?superintendent level?, after being alerted to the incident by AP. The police spokesman told AP: ?We will ensure that a message goes out to our officers. Aside from having regard to the privacy of people possibly injured in accidents, police should not be advising bystanders not to take photos. ?Police have some restricted powers to request or seize photographs as evidence, or to investigate regarding offences under anti-terrorism legislation, but neither of these would have been appropriate on this occasion. ?Our apologies to your reader if they were inconvenienced.? Though the photographer feels officers overreacted when dealing with someone taking pictures in a public place, he does not plan to issue a formal complaint against the force. Officers from the Met?s Traffic Command have been assigned to investigate the circumstances of the crash, according to the Sutton Guardian, which reported that officers involved sustained whiplash injuries.